When it comes to cosmetic dentistry, one of the most common problems is irregular position of the front teeth. Numerous patients, however, give up on the idea of orthodontic treatment (wearing fixed braces), because of the treatment’s duration, price or unwillingness to wear conspicuous brackets. In that case, they opt for a restorative approach such as porcelain facets. On the other hand, there is a very efficient solution that corrects the position of the incisors and canine teeth and at the same time it eliminates inconveniences such as constant pressure and high price. What is Inman Aligner and how does it work? Patients themselves can place and remove this simple appliance that provides keeping track of the shifting of the teeth to adequate positions. 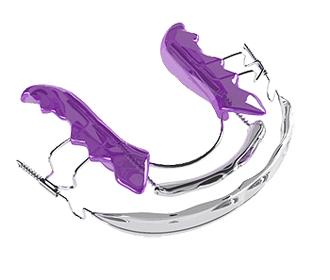 Inman Aligner consists of a nickel-titanium springs placed on the inside and outside of the dental arch that align teeth and help position them properly in a very short period of time. The two aligner arches mildly oppose one another and shift the teeth to proper positions. The inner arch pushes teeth forward, whereas the outer arch pushes them back inside. These two mild forces produce a substantial shifting range that causes Inman Aligner to quickly bring about effects. How long does Inman Aligner treatment last? After taking the anatomic impression of the teeth, the device is custom-made for the patient. Then the appliance is used for 6 to 18 weeks, which is sufficient to achieve optimum results. During this period, the patient should wear the device for 16 to 20 hours a day, and come for check-ups every two weeks to keep track and control the progress. After therapy, we advise retention so as to secure a long-lasting result. Who is advised to use Inman Aligner? Since they are safe and comfortable for the teeth, Inman Aligner braces are suitable for anyone who wants to straighten their incision and canine teeth with less crowded dental arches of 3 and not more than 5.5 mm. It is also necessary that lateral teeth, as well as the ones that are to undergo this treatment, are completely developed and erupted. This device also provides an ideal treatment before cosmetic restorations such as lumineers. Once placed, Inman Aligner method guarantees success which further depends on the patients – regular check-ups and hygiene which is not in the least complicated.